One of the (many) things I love about going into a real-world, physical bookshop is the potential to meet a book I wouldn't normally read. Recommendations tables are a favourite hang out of mine, and if that doesn't work I have no problem with tapping the bookseller for all they're worth. Sure, it can be good to have suggestions based on favourite authors - they're safe - but with so many writers and genres out there it would be sad if we only stuck to what we know. So I was particularly impressed when I visited The Kew Bookshop in west London and found myself surrounded by hundreds of note cards with mini introductions to all manner of books. From award-winners to forgotten favourites, serious or light, novels I've read and many I've never seen before, all inviting browsers to consider something new. And for shy readers what could be a better way to meet a new book than lots of lovely hand-written introductions? Or, for those of us more prone to chatter, the cards are a perfect ice breaker with the bookseller or other customers. For me the ice was broken by the card introducing The Art of Fielding by Chad Harbach. Written by The Kew Bookshop's Mark, the description ends with 'it all makes for an incredibly generous and warm-hearted novel with beautifully drawn characters you really care about and a wonderfully lyrical and moving ending'. Having read the plot synopsis, generous and warm-hearted were not words I was anticipating, so I'm looking forward to reading about a subject I've not encountered before and seeing how the bookshop's review applies. While walking around the bookshop I took lots of photos of the cards, at the time thinking it would help share the excellent reviews and show you how great they are, but as I write I realise it would be wrong to share them here. Instead the only recommendation I need to share is to give is to encourage you to go and visit and see the cards for yourselves - and allow them to introduce you to your next great read. Not even a stone's throw from Kew Garden tube station it's certainly easy to find and definitely worth your time. And the thing about recommendations? The reason I visited The Kew Bookshop was because someone got in touch to tell me how great the place is. 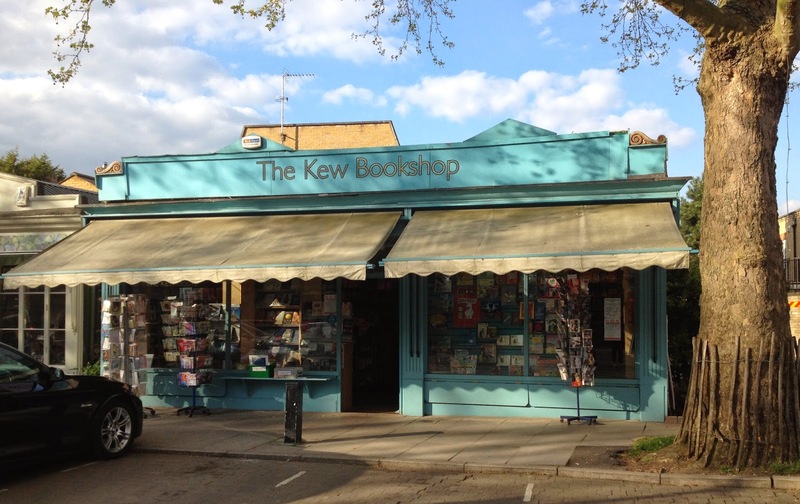 UPDATE: I've just heard The Kew Bookshop is under threat of closure. Bookshops are already far too endangered and it would be a tragedy to lose this little gem to 'luxury retail'. Please sign the petition to help save this one. The thing about bookshops is that, no matter how many you visit (this is my 47th), you can never run out of new things to find. Whether it's a new author, a book (any book), a great bookseller to chat to or perhaps a wonderful setting - there's always something different to discover. 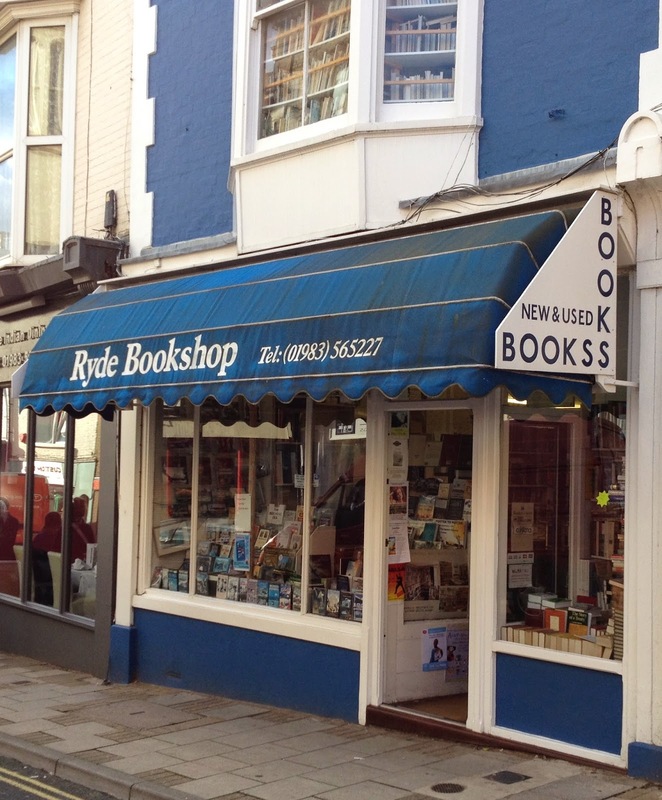 But when I entered Ryde Books I somehow forgot that. Time was short, friends were with me and - while they were happy browsing - I was conscious about keeping them waiting too long. So I rushed around the bookshop, taking in the tall shelves and narrow walkways and massive variety of new books crammed into a space reminiscent of a traditional secondhand bookshop. It was a fascinating space but I didn't appreciate it as much as I should with all the rushing round. Instead I noticed snippets; sci fi authors I'd not previously encountered, a good range of lighthearted fiction, some fascinating but unexpected titles among the classics - the bookshop describes itself as stocking specialist, rather than bestselling books. I was happy, but not overjoyed. Then I heard someone mention The Door. I'd walked all around the shop, but in my rush to take everything in I'd only looked at the books, somehow missing the large poster advertising the secondhand section. I opened The Door and stepped through. And it was a bit like falling down the rabbit hole. I felt I was discovering a secret kept from the rest of the world. Because if the main shop was a maze of shelves, it hadn't even remotely prepared me for how much was waiting to be discovered behind The Door and how much time would be needed to properly explore this series of hidden rooms crammed with knowledge and adventure. My friends were forgotten in the front room, I was in full book browsing mode in a new (old) world. The bookshop had a great selection of everything, so I was bound to be happy while exploring all the secret rooms, but as I was in the secondhand section my thoughts couldn't help but turn to sci fi - secondhand is where all the best sci fi gems are found. Which is where I made my final discovery of the day, the Space Trilogy by C S Lewis. Until my visit to the island I'd not even known the famous author had written science fiction, so I'm certainly looking forward to finding out what his books are like, even if I'm not sure how train-friendly the cover artwork is. Clutching my finds I returned to the modern world and my friends. They hadn't found The Door, and when I came to look back over my photos they were all out of focus, meaning I can't help but wonder if all those secret rooms were only a dream? It may polarise readers, but I'm a cat person. My feline housemate sits on my lap as I write, headbutts my book when I read, and at other times she stalks around the house, climbing over and under and around piles of books in search of her toys. Given she's scared of mice and birds, the stalking is generally restricted to indoors, but it's still very cute to watch her. Instead I'm the hunter of the house, and my quarry are bookshops and their contents. Okay, so the metaphor's a little laboured, but given that this week's find is Little Mouse Books in Maidstone, I couldn't resist the excuse to drag Dolly into the blog. Because - despite its being in the town where I currently live - I really did have to go on a hunting expedition to find this bookshop. Hidden away in a small, very quiet shopping arcade behind one of the main streets in the town, this delightful little children's bookshop apparently opened towards the end of last year, but it only came onto my radar thanks to a chance recommendation to try internet bookseller Hive. I'm not going to pretend I know everything about the town, but I do spend a lot of time looking for bookshops, so I was mortified when I realised I'd missed out on this shop for so long. But enough about me, let's get back to Little Mouse. With a large arched window, even the shape of the front of this children's bookshop encourages you think of a mouse hole, making it a perfect place to retreat from the noise of a busy town centre. Filled with colourful, interesting books for all ages (mostly children, but adults aren't forgotten), some new, some secondhand, along with a gruffalo or two and an array of woodland animals - including little mice - the shop is a bright and inviting bolt hole for book lovers. There's even a colouring table to entertain youngsters who are yet to learn the wonder of their surroundings. There was just one thing missing. Children. Because as lovely - and very reasonably priced - as Little Mouse Books is, it really was quiet as a mouse during my visit, with just one family introducing their child to the joy of reading. The bookshop hosts reading sessions and is open to orders of new books, as well as being a destination for Hive shoppers to collect further purchases, so there are plenty of extra reasons to visit if - for some bizarre reason - the destination itself isn't enough, but I'd dearly love to see a few more people through its doors. Why? Because I desperately want Little Mouse Books to be a success. I left the shop with Heidi by Joanna Spyri and a little mouse of my own, but most of all I left knowing there's a nearby independent bookshop for me to return to, but that will only happen if more people join me in welcoming Little Mouse to the town. So who's coming into the mouse hole?